Get kids to write down their greatest achievement on a piece of paper. Choose a few kids to share what they wrote down to the rest. Then get the kids to make aeroplanes out of their piece of paper. Divide them into 2 groups; 1 rep from each group to hold a wastepaper basket. The rest line up in their groups and try to fly their paper aeroplanes into their group’s wastepaper basket. The group with the most aeroplanes in their wastepaper basket wins. Nehemiah 3:14 Malchijah the son of Rechab, leader of the district of Beth Haccerem, repaired the Refuse Gate; he built it and hung its doors with its bolts and bars. When Nehemiah first went to examine the walls of Jerusalem, he went out through the Valley Gate until the Refuse Gate (Neh 2:13), where he saw the broken walls and burnt gates. The gate was named “Refuse” or “Rubbish” probably because it was where the garbage and ash from the temple was removed from the city in to the Valley of Hinnom, where they were burned. 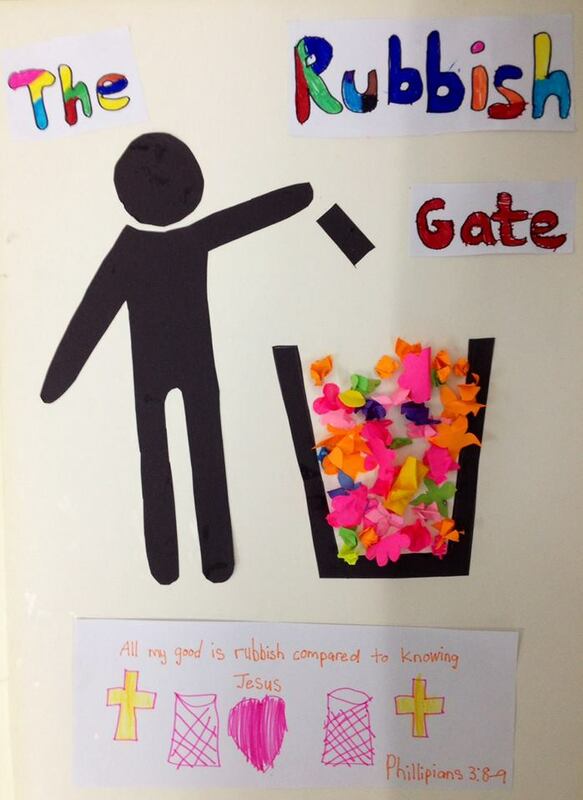 What does the Rubbish Gate remind us of? Saul was circumcised on the eighth day, like all good Jewish babies were. He was a true blue Jew, from the tribe of Benjamin. He was a Pharisee — a religious leader who prided themselves in keeping strictly to God’s laws; as far as the religious laws were concerned, he considered himself faultless. He thought by keeping the laws, he can be right before God — he can earn his place in heaven. He was zealous for God — he persecuted the Christians and dragged them off to prisons because he considered them a threat to Judaism — how can Jesus claim to be God?! “I am Jesus,” the voice said. Jesus told Saul to go to Damascus. When Saul got up from the ground, he realized he was blind! He had to be led by hand into Damascus. He didn’t eat or drink for 3 days. Then God asked a believer, Ananias, to go see Saul and pray for him. Even though Ananias was afraid (he knew Saul came to hunt down Christians), he went and placed his hand on Saul. Immediately, something like scales fell from Saul’s eyes and he could see again. Saul later changed his name to Paul — he became the champion of the gospel of Jesus Christ to all the Gentiles (people who are not Jews). Through all these, Paul realized that all his good, all his law-keeping, would not get him to heaven. Instead, only Jesus could make him really good. That’s why he wrote in Phil 3: 7 But whatever were gains to me I now consider loss for the sake of Christ. 8 What is more, I consider everything a loss because of the surpassing worth of knowing Christ Jesus my Lord, for whose sake I have lost all things. I consider them garbage, that I may gain Christ 9 and be found in him, not having a righteousness of my own that comes from the law, but that which is through faith in Christ—the righteousness that comes from God on the basis of faith. All his merits, all his accomplishments, all the good things he did, all the laws he kept — Paul said he now considered them “rubbish”! Just like how we wrote down our biggest accomplishments and threw them into the wastepaper basket/dustbin … Paul threw all his accomplishments into the dustbin too. This was because he realized that all he needed was Jesus. He could not become righteous on his own efforts. Only through faith in Jesus’ finished work on the cross could he be right before God. 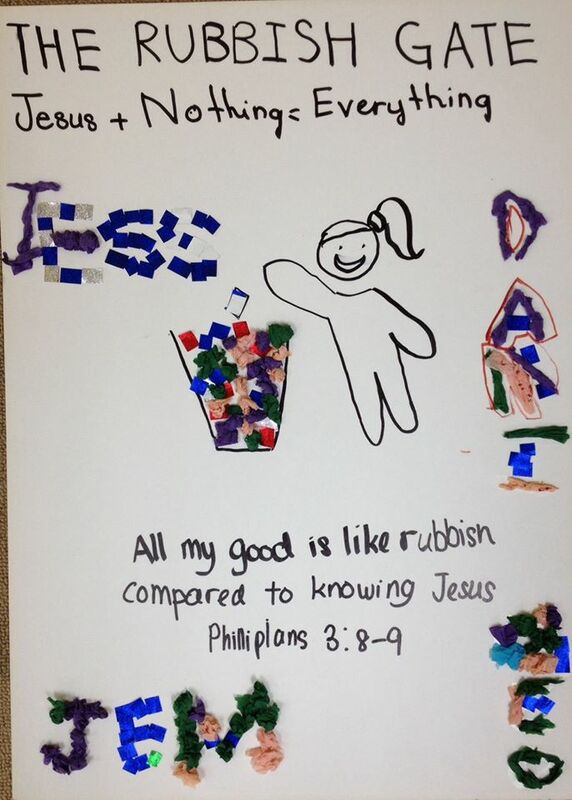 Compared with knowing Jesus, all his other accomplishments were rubbish/dung! Jesus + nothing = everything! 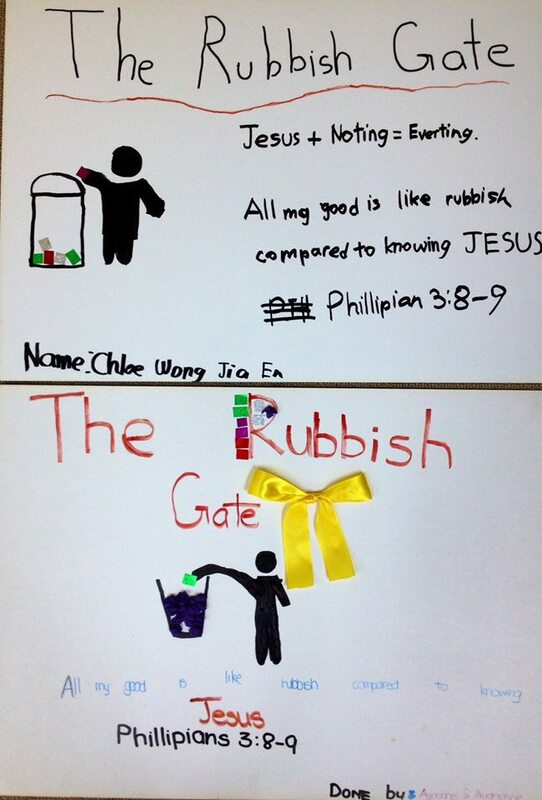 The Rubbish Gate reminds us that all our good is rubbish! Jesus + nothing = Everything!